Want to play lotto games for real money from the comfort of home? We explain more about the safe payment methods available at the leading online lotto sites and how you can use these payment services to play online lotto for the chance to win real cash prizes from the comfort of home. Which are the best online lotto sites? 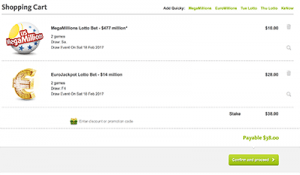 When it comes to safe, reliable venues to play lotto games on the Web, there is one site we recommend above all else – Lottoland.com. This lotto site is 100% legal and legitimate and has soared in popularity as more players take to the Internet to benefit from the convenience of online play. This service is available to players from all over Australia, excluding South Australian residents. The important thing to remember when making purchases at Lottoland is you are actually participating in what’s known as “lotto betting” as opposed to straight-up purchasing lottery tickets. Ultimately, this means you are betting on the outcome of a lottery draw instead of buying a ticket to the lottery draw, although you stand to win the exact same amount of money and buy-ins are more affordable. Note that some credit card transactions at Lottoland may be subject to a ‘cash advance fee’ as your bank may recognise it is as a gambling transaction. This is the sole discretion of your financial provider and has nothing to do with Lottoland. You will need to check with your bank to see if a cash advance fee will be applied to your credit card payment. To start participating in lotto betting at Lottoland, you will first need to sign up for an account, which you can do so using our links. This is a fast and simple process and just requires you to confirm your name, email address, contact information and date of birth. Once you have activated your account, you can scroll through all the different lottery draws that are available to bet on, including US Powerball, EuroMillions, US Mega Millions and all the popular Australian lotteries. Click on whichever lottery draw you would like to bet on and click inside the ticket grid to select your numbers. If you’d rather have the computer auto-select numbers on your behalf, simply hit the ‘Quicky +1’ button. Once you’re happy with the numbers you have selected, click the ‘submit’ button to head to the checkout where you can confirm your shopping cart and then proceed to pay for your bets. You will also have the option here of adding a Quicky ticket for the most popular lotto draws: Mega Millions, EuroMillions, Tuesday Lotto, Thursday Lotto and KeNow. If you have a discount code, you can enter it in the checkout. Hit ‘pay now’ and simply follow the prompts to choose your payment method from the options listed above and enter your payment details to complete your transaction. You are then in the draw with a bet on the outcome of your chosen lottery. If the numbers you bet on are drawn, you stand to win some serious money. How are these payments kept safe? All financial transactions at our recommended lotto sites are protected by 128 Bit SSL (secure socket layer) digital encryption security, which is the same level of online security used by leading Australian financial institutions like Commbank, ANZ and NAB. SSL encryption works by scrambling all data sent over a secure connection, so your private information can’t be intercepted by prying eyes. You can tell if a website is protected by SSL by looking in the URL address bar at the top of the page. If it is SSL protected, the URL will begin with “https://” and it may also be highlighted in green or contain a small image of a padlock. If you’re still unsure, just stick with our recommended lotto sites so you can enjoy the peace of mind of knowing you are playing at a reputable, safe website. If sending money on the Internet in any format makes you wary, why not opt for a web wallet service or a pre-paid voucher to provide you with an extra layer of security. Now that you are feeling more comfortable with the payment options available at lotto websites, head to Lottoland.com if you want to start playing lotto online for the chance to win real money from some of the world’s biggest jackpot lottery draws.